Around this time of year (March-late April) black boy peaches start appearing here and there. Although these delicious velvet babies aren’t usually available at the supremarket, you might just be able to find them at your local Farmer’s Market or your neighbours garden! Black Boy peaches are perfect in pies, crumbles and the like. They’re the perfect mix of sweet and sour and they sport the most gorgeous vibrant colour. Last night I came home from work to a big pot of stewed Black Boy peaches sitting on the kitchen counter. I may have had one or three spoonfuls but you’d be proud to know I resisted from accidentally eating the whole thing. 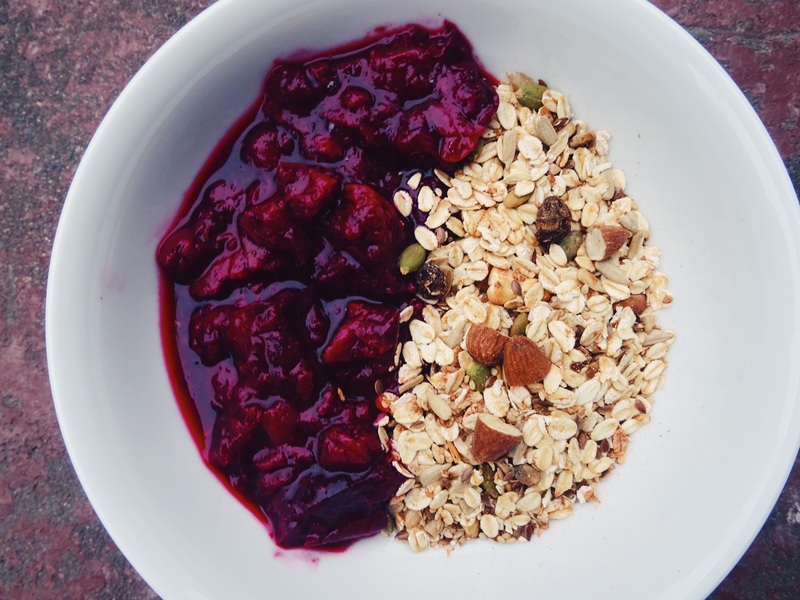 This morning however; I had a huge amount with my muesli and it was seriously divine. Note: huge amount is not pictured above. Huge amount is currently in my stomach. Mum assured me that the recipe was so basic that she’d hardly call it a recipe at all. Serve with your favourite breakfast muesli, bake into a scrumptious sweet treat or enjoy as is!